Pearls of Northern Poland, 2018 - 2019 tours to Poland - discover exciting Poland with us! Your arrival at Warsaw airport or train station, where you are welcomed by our driver. Transfer to a centrally located hotel. Time to relax and an overnight stay at a hotel. Breakfast. Next, half-day guided tour of Warsaw, including all of the most important places in Polish capital: the Old Town with the Royal Castle, The Royal Route and Łazienki – the Royal Park. You will see also places like the former Jewish ghetto, the Monument to the Warsaw Uprising of 1944. Later that afternoon time to relax, private walks or gift shopping. Optional Chopin music concert at evening time. Dinner and an overnight stay at a hotel. Breakfast, departure with our guide-driver to Toruń. Later on that day the city tour, with visit to the house of Nicolas Copernicus, the Town Hall, St. Marys and St. Johns Church and the ruins of the Castle of the Teutonic Knights. Afternoon check-in at a hotel. Dinner in a local restaurant and an overnight stay in a hotel. Breakfast, transfer to Malbork – the city is on the UNESCO list for having one of the worlds most unique monuments: Malbork Castle - the former residence of the Grand Master of Teutonic Knights - it also contains Polands largest collection of amber. Castle tour with local guide. Next, transfer to Gdańsk, dinner and an overnight in a hotel. Breakfast, guided tour of Gdansk - Old Town: Golden Gateway, Neptunes Fountain, the Artus Court, the Uphagen House and Dluga Street, Mariacka Street, the wooden Crane on the River Motlava and a stroll around the yacht harbor. Next visit to the Solidarity Monument at Gdansk Shipyard, the birthplace of the solidarity movement and continuation of the trip with a transfer to Oliva, where you will enjoy a recital of organ music in the Oliva Dome with its famous organ. 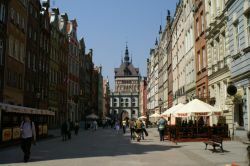 Return to Gdansk, dinner and overnight stay at a hotel. Breakfast. Guided tour of Sopot - a lively seaside resort popular for relaxation, the port in Gdynia and Gdynia Aquarium, a maritime museum based in an historic ship, return to Gdansk. Free time in the city center for gift shopping, farewell dinner in a fishermans restaurant, overnight stay at a hotel. Breakfast, a boat trip around the port of Gdansk passing the Westerplatte, where the Second World War started or visit to Sztutowo – famous as a place of German Nazi concentration camp from II World War (a Museum nowadays). Return to Gdansk airport or train station for your departure. Tour dates: tour starts everyday between 1st of March and 1st of November 2019 on your request. - entrance tickets according to the program. - larger group prices on request. Gdynia was born out of dreams and very wisely invested less than 80 years ago, highly recommended for those who loves nature and for the adventurous. Gdynia is on the northern edge of the Tri- City. If you need to get there from Gdansk, you always cross Sopot, the resort at the Baltic Sea. Gdynia is well known thanks to its shipyards, currently the most prosperous Polish city. Gdynia has got a seaside location, a seaside promenade, along with Sopot and Gdansk seaside, a pleasant vacation area in this part of Poland.